Quezon City – Famous for its durable and affordable shoes, the City of Marikina was home to some 200,000 shoemakers and 7,000 factories during the shoe industry’s heyday in the 1970s. Today, it flaunts the world’s largest shoes. The city is also a breeding ground for shoe designers. The “Shoe Capital of the Philippines” is located in the northeast of Metro Manila and is currently one of the most competitive cities in the country. Before becoming known for its shoes, Marikina was recognized as a big producer of rice and vegetables. It was first inhabited by the Augustinians in 1500, followed by the Jesuits in 1630. The town was first called “Marquina,” after the Spanish governor-general Felix Berenguer de Marquina; the name was changed to “Marikina” during the American occupation in 1901. It became a city on December 8, 1996, during the mayoralty of Bayani Fernando. People from Marikina used to be makers of slippers and wooden clogs, up until Don Laureano Guevara started the shoe industry in 1887. “Kapitan Moy,” as he was fondly called, was born in July 4, 1851. He first discovered the art of shoemaking after fixing his own pair of imported shoes with the help of Tiburcio Eustaquio, a bakya (wooden clog) maker. He trained himself and mastered the craft, and eventually opened a family shoe business at the ground floor of his house. Shoemaking thus became an alternative source of income for the many local residents whom Kapitan Moy employed— among them, Ambrocio Sta. Ines, Gervacio Carlos, Sixto Isidro, and Venancia Santiago. By the end of 1891, the town already had around 15 shoe factories. The Shoe Museum carries many shoe collections. One set was contributed by Imelda Marcos, the former first lady of the Philippines: 749 pairs of branded and Marikina-made shoes. The museum also features shoes of famous people, including Philippine presidents, celebrities, ambassadors, and political figures, as well as traditional shoes from different countries. 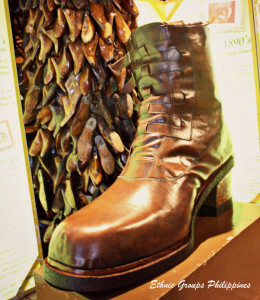 A life-size mannequin demonstrating the art of shoemaking is also on display. In 2002, the city built the world’s largest pair of shoes, measuring 5.29 meters long and 2.37 meters wide (certified by the Guinness Book of World Records in 2002). Made of genuine leather, the pair took 77 days to build and cost more than two million pesos. A testimony to Marikina’s shoemaking prowess is the fact that two famous shoe designers from the United States, Brian Tenorio and Jeffrey Campbell, learned their craft in small factories in this city. Brian, a Filipino-American based in New York, grew up in Marikina and has been busy promoting Marikina-made shoes to push the industry back to its peak. Meanwhile, Jeffrey Campbell of Los Angeles came to Marikina and worked in a fashion design house.